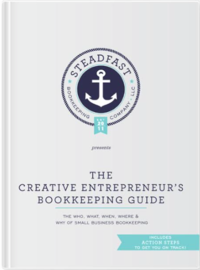 Get to Know the Steadfast Bookkeepers! I’ve talked a bit before about how important the team at Steadfast Bookkeeping is to me, and today I want you to get to know some of our MVP’s just a little better! Steadfast has a team of three amazing bookkeepers:: Noel, Sarah, and Jessica. I (Stephanie) oversee and manage each of the client accounts that they handle. We work together to make sure our clients receive quality attention and that their books are perfectly managed. We use our bookkeeping system to keep your records consistently and accurately. But, today I want to share some background info on these three multi-faceted, smart ladies who help run this ship. Enjoy our chats below! How long have you been a bookkeeper and how did you get started? I have been in the accounting field for a little over 6 years. I kind of fell into it in college. I was interested in business but wasn’t certain accounting was what I wanted to do. Many accountants are corporate types with no sense of humor and that just isn’t my personality. So to get some experience, I started as an intern for a CPA firm in Mobile, AL. It was not as “corporate” as most accounting firms. I loved it because it was there that I learned just how many options are available in this profession. What do you think is the biggest bookkeeping challenge facing small business owners? Easy, it’s TIME. Small business owners really don’t have the time to keep their books up to date. The thing is, they shouldn’t have to! They should be out growing and promoting their business versus categorizing expenses. What is the first thing you do when you start your work day? If you could have lunch with one person who inspires you, who would it be & why? This one is tough. Life is so crazy, you think you have it all figured out and then something comes around and it makes you really question everything. To that end, I think right now it would be Joshua Millburn. I have always been interested in minimalism but I am really trying to put it more into practice in my life. It can be challenging with kids because they want everything but really they need very little. It’s an interesting topic and he did a great TED Talk on it – everyone should check out! What’s your favorite bit of bookkeeping advice? Don’t let it go for too long. It’s just like anything else, the more you put it off, the more it snowballs. I have a toddler and an 8 month old so I spend most of my free time entertaining them. We go to the beach and go out on the boat a lot, especially this time of the year. I don’t get to watch a lot of TV so, when I have a minute, I like to catch up on my shows. We also have started to grow our own food. We had some success with peppers, cilantro, and kale a couple of months ago so I’m hoping in the next couple of weeks we will have some different stuff ready to pick. I began bookkeeping in 2003. I was in school and someone asked me asked if I’d be interested in a part time job doing bookkeeping for their small business. I’d never considered bookkeeping before then, but realized I loved it. I think the stress of trying to do it all alone is a challenge almost all small business owners face. I check my email to see if there are any clients I need to respond to. I always try to do that first before getting into my other work for the day. I’d pick Joanna Gaines. I absolutely love her style, but more than that she is creative, not afraid to follow her dreams and has built an amazing business, all while raising her family. She seems to juggle it all so well! It’s easier to keep up than to catch up. Staying on top of your bookkeeping weekly is so much easier than trying to catch up on the past year at tax time. I love spending time with my husband and 3 boys, whether it be at their sporting events or just spending time together as a family. My husband and I also love to do DIY projects together. How long have you been a bookkeeper? I’ve been doing bookkeeping for 12 years now. I’d say the biggest challenge is knowing all the right taxes, forms and filings that need to be submitted and when especially income tax. I’d encourage owners to make it a priority to set aside money for estimated income taxes. I check my emails and respond to client emails first thing when I get started each day . Kavita is a spiritually strong, passionate woman from my church who is down to earth and always encouraging. I’ve only known her for over a year now but has deeply blessed my life. She wears many “hats” yet when I am around her, she inspires me to be more of who God has called and purposed me to be. She is gentle in her approach and always leads you back to Jesus Christ. She is refreshing to be around and I always look forward to our conversations. Hire a bookkeeper ! 🙂 Keep your bookkeeping streamlined by separating your personal and business expenses using different credit cards and especially a separate bank account. Also, going back to the biggest challenge facing business owners, to know how to estimate your income tax, compare your profit & loss from last year and if you’re making more money each quarter than last year, pay in more or set more money aside to pay at tax season so you aren’t surprised. Camping with my husband and son using our travel trailer . There you have it! Some background on the ladies that are currently, or are looking forward to, keeping your books in tip top shape! Have a question for one of our bookkeepers? Give us a shout!